The WTT Get Together weekend on Dartmoor on 18th and 19th May may be of interest to some RTFA members. For details see links below. As you all know I conduct a beat survey every season. The beat survey numbers for 2018 were as follows: 72 salmon, 71 sea trout and about 2,000 brown trout. This compares with 2016 numbers of 185 salmon, 302 sea trout and about 2,500 brown trout and 2017 numbers of 286 salmon, 214 sea trout and about 2,300 brown trout. Preliminary rod catch numbers from the EA are not yet available. Given the extreme drought conditions for a large part of the 2018 season these numbers should not surprise us and are not out of line with early reports from other south-west rivers. We must hope for a bounce back this coming season provided that we have normal river conditions. The continuing decline of sea trout numbers is a real concern. This is the second season that sea trout numbers have dropped below salmon numbers. Efforts are being made to discover the cause or causes, not a simple task since we all know that sea trout are mysterious creatures. Are the problems in-river or at sea or a combination of both? We need to find out if we can. Taw Fishing Club currently has openings for a small number of new members. 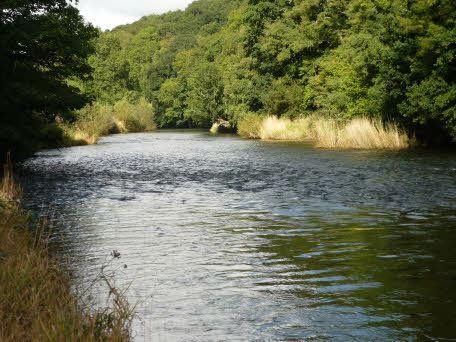 The Club has first class brown trout water on the Upper Taw - 3 miles of river near Coldridge and the newly rented 2.5 miles of Tremayne Water near Bridge Reeve - and there is always the chance of a salmon or sea trout. For full details of membership, subscriptions, etc. please refer to TFC's website - www.tawfishingclu.org. Anyone interested should be in direct touch with the Club's Chairman, Gordon Murray (G.Murray@exeter.ac.uk; 01769 520 775). A nice Christmas present from Defra. The new salmon and sea trout byelaws have been confirmed. They will come into force on 1 January 2019. - Salmon and sea trout netting in the estuary will cease; the three licenced netsmen will not have their licences renewed. Since drift netting for bass and mullet has already been banned this means that the only netting permitted in the estuary will be for sand eels. Enforcement will therefore be straightforward. - As regards our own fishing we will be expected to maintain release levels for salmon above 90%. This is a bit higher than we have been running at in recent years. The threat of 100% catch and release has been avoided. I would like to thank all members who took part in the original EA Salmon & Sea Trout Consultation. A co-ordinated approach by RTFA, SWRA and other river associations and their members in the south-west has given us the result we were looking for. In due course I will be sending out an email to members which will set out the Committee's views as to how we should react to the changes in our day to day fishing. The Mole webcam is live again. It is now situated below Head Weir Falls. As you all know, the RTFA Committee is concerned about the state of the 35 STWs on the Taw catchment operated by South West Water (SWW) and the pollution they cause in our river system. Grey sewage fungus is a very obvious pollution sign. Any RTFA fishermen with access to the river near a STW who sees this fungus is encouraged to take a picture and forward it to me at gibson2sms@btinternet.com. with details of location. This will help us build our case against SWW. As most of you will know river conditions are dire and there is no sign of the kind of rain that will bring the river up to a proper level. Even though you may not be fishing at the moment do find time to visit the river. At the very least your visit will frighten off the predator birds which unfortunately have been having a field day. All incidents should be reported to the EA hotline - 0800 807060. Please access the link below to read the latest on the delay to the proposed salmon byelaws from Angling Trust. We have all been involved in the consultation that led up to this point. If, as and when the proposed byelaws are introduced next year the effect on the Taw will be no more salmon netting in the Taw/Torridge estuary and a requirement on us fishermen to reach and maintain at least 90% catch and release if we are to avoid 100% catch and release being imposed on us. 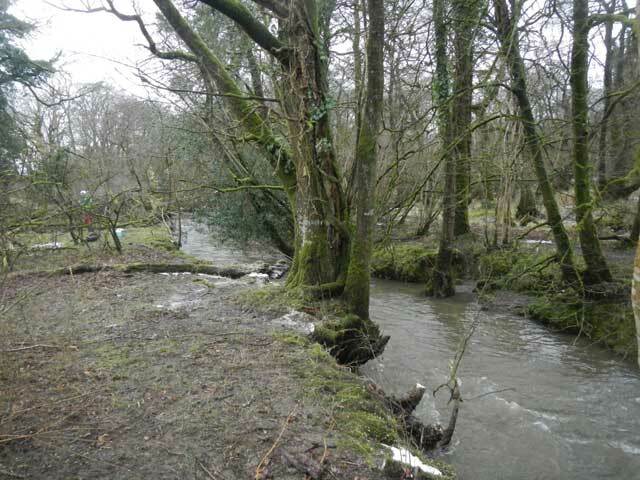 We have been working with Westcountry Rivers Trust on a jointly funded basis to improve the Little Dart. 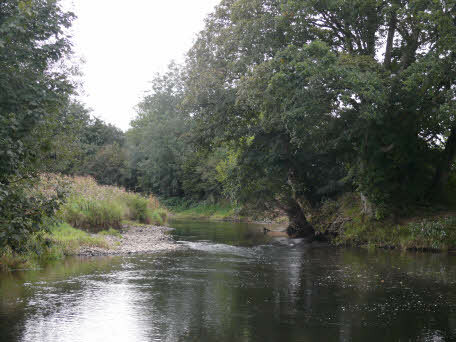 This Upper Taw tributary and its own tributary, the Sturcombe, have in the past provided valuable spawning grounds for salmon and sea trout and attractive brown trout fishing. 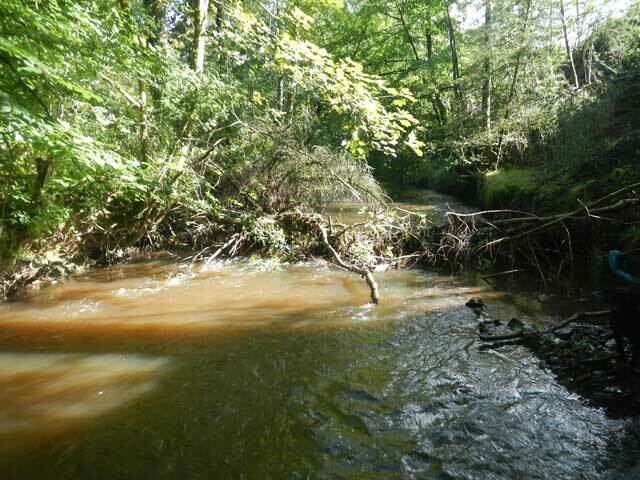 Neglect, an over-abundance of dairy activities and the prevalence of certain arable practices which lead directly to siltation have greatly damaged these two attractive streams. There are two biodigestors on this small system whose appetite for winter maize in particular adds to problems. We can only keep our fingers crossed that these two plant are properly maintained under the bizarrely named "owner self-monitoring". 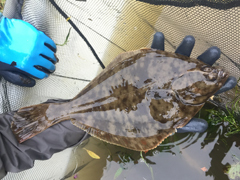 It is worth noting that a biodigestor on a tributary of the Tamar developed a fault recently and this led to a bad pollution and fish-kill incident. 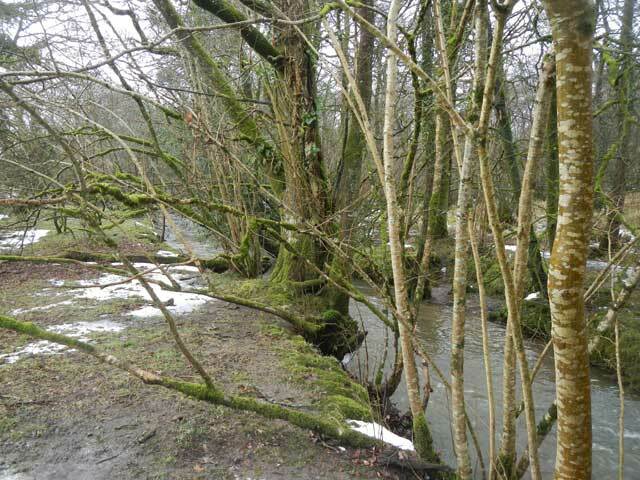 Last season WRT cleared 14 debris dams, cleaned 17 spawning sites and carried out selective coppicing and wood debris enhancement work to about 3 km of bank. The pictures that follow show some of this work. This season we hope to be able to do more of this valuable work on the Little Dart and Sturcombe. Proposed National Salmon and Sea Trout Protection Byelaws. We have just heard that measures to regulate both nets and rods will be delayed until 2019. RTFA AGM at Highbullen on 23 March - Summary. This was a successful and well-attended AGM enjoyed by members and guests. The Chairman, Alex Gibson, gave his report which can be accessed via this link. Click here to read. The Treasurer, Richard Nickell, outlined a comfortable financial position at year end. In summary, income was £5,773 and expenses £11,687. These expenses include £3,788 for the Little Dart walk-over survey and £5,000 for Little Dart improvement work, both commissioned by us from WRT. Available to us we have £3,377 in RTFA's account, £13,948 in our River Taw Trust account and £23,000 held to our account in WRT. The RTT account received a very generous £5,000 legacy from Ron Warwick. The first speaker, Paul Carter, our EA Fisheries Enforcement Officer, ran through the recent changes to netting byelaws in the estuary and emphasised the importance of reporting anything untoward on the river to the EA hotline, 0800 807060. The guest speaker, Bill Beaumont, Senior Fisheries Scientist, Game & Wildlife Conservation Trust, from the Frome, gave a most interesting talk on Salmon & Silt - A Recipe for Disaster. This gave all present much to think about given the recent damaging increase in run-off from fields in our catchment as a result of farming practices which are not conservation minded. Perhaps the most dramatic charts showed the effect of siltation on gravel beds which not only limit the ability of our salmonids to spawn, but also significantly reduce the viability of the eggs where spawning has been possible. The immediate and positive effects of gravel cleaning were clearly demonstrated. Changing farming practices will be a long, slow process; gravel cleaning which we already undertake is a quick win. The question and answer session was very lively. The auction was very successful and has raised around £4,200, thanks to the efforts of our auctioneer, Chris Taylor, and the generosity of those who put up the lots and those who bid for them. Highbullen produced an excellent dinner for those who stayed on after the auction. Dallyn's Dairy stream 'thick with cattle dung' near Barnstaple. The new IFCA byelaws for Devon have finally been signed by the Minister. This means an end to the salmon and sea trout by-catch in the Taw/Torridge estuary by those netting for bass and mullet. The only netting permitted will be by the licenced salmon netsmen, who are themseves under threat from a possible ban, and those netting for sand eels. This is a major step, the result of a long and difficult process. Please note that the date of our next AGM has been changed from Friday, 16 March to Friday, 23 March 2018. It will be held at the Pavilion at Highbullen Hotel, Chittlehamholt, and will start at 5.30pm. When the Taw above Colleton Bridge was diverted into its new channel at the end of September fish had to be rescued from a 100 metre stretch of the old channel which was cut off. Fishtek carried out the rescue and very kindly provided an inventory which is set out below. It makes interesting reading, but since this was a one-off operation conclusions are hard to draw . 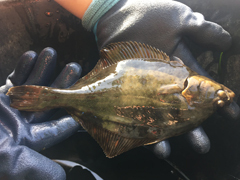 The most surprising item was two sizeable flounders (see pictures). The new river course has now been opened up and the old river course closed off. Investek have handled the fish rescue and we hope to have a full inventory from them shortly. This should make interesting reading and will be put on the website. The two pictures below show a map of the project and the opening of the new river course, a gradual process with the coffer dam removed piece by piece. The editor of the BurringtonParish Community Magazine, Carole Poulton, has very kindly allowed us to use her excellent and detailed article on the project which is accessed by clicking on the link below. Congratulations to the Taw Fishing Club and Good News for the Upper Taw. TFC have been awarded £2,500 from the Environment Agency for river improvements to be completed in autumn/winter 2017. This will be matched by £2,000 from TFC's own funds and £500 labour equivalent. This is TFC's second grant from the Fisheries Improvement Scheme in two years and reflects in large part the confidence that the EA and other fishing related organisations - Westcountry Rivers Trust, Wild Trout Trust and ourselves, RTFA - have in the work that TFC has been doing to assist the environmental quality and security of our waters. TFC is a very active fishing organisation. It should be noted that they are the largest provider of RiverFly volunteers monitoring the Taw. The Upper Taw above Colleton Bridge takes a loop close to the Tarka Line and is in danger of undermining the railway line as a result of spates and floods over the years. See picture attached. Network Rail has contracted CML to redress the situation by redirecting the course of the river. See attached plan. RTFA is not directly involved in this project, but has an interest to the extent that the works affect fish and fishermen. 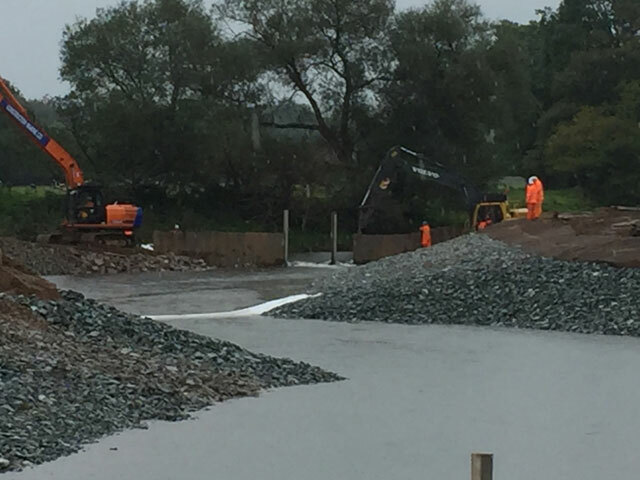 The Environment Agency is fully involved and has provided the necessary approvals for the work to go ahead. This is a major project as you can see from the plan. It was started about three weeks ago and is currently running ahead of schedule. In-river work should be completed by 30 September. Until the new river course has been finished and opened up and the old river course closed off, there should be no downstream effect in terms of water discolouration. At the point of opening/closing there will be discolouration downstream. Fishing may be disrupted for a day as was the case when Head Weir Falls was brought into service. We hope to be in a position to advise members of this in advance. 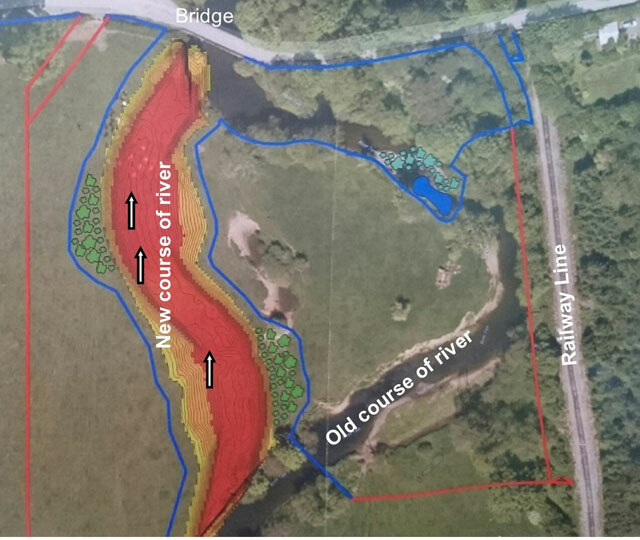 We are pleased that Fishtek, with whom we worked on a number of the weirs, will be in charge of fish rescue at the time of the switch from old to new river course. They have experience of this type of work. 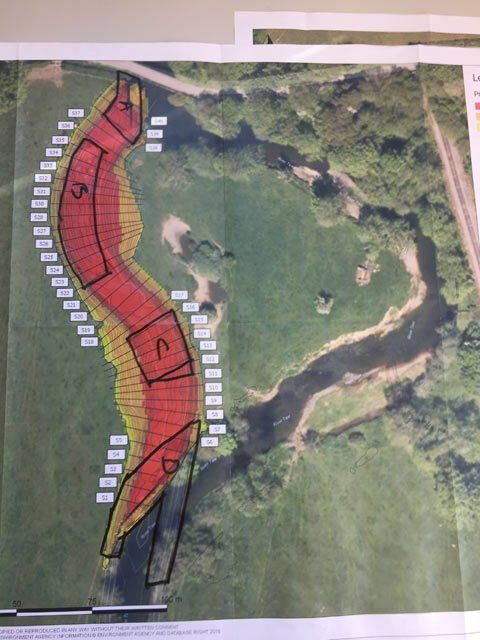 The new river-bed is being engineered to provide pools and riffles, new trees will be planted and everything will be done to make the course of the new river as natural as possible. There is a good view of the site and the progress being made from Colleton Bridge just off the A377. It is with great sadness that I report the death of Mac McCarthy earlier in the week. As you will all know Mac loved the Taw. He was an active and successful fisherman and a stalwart of RTFA in his role as Treasurer over so many years. Our finances were kept in impeccable shape by Mac and his help was invaluable to me from the moment I became Chairman. This is particularly true in respect of the two fund-raisings for the Taw Access over Weirs Project and TRIP. He will also be missed more widely in the south west where he was well known by all the river associations from his time as Treasurer of the South West Rivers Association. Mac moved away from North Devon to Hampshire about two years ago. Pink Salmon Threat - Angling Trust Information and Advice. Pink Salmon - Angling Trust News. Westcountry Rivers Trust 2016 Annual Review: Confluence. As you know we work closely with WRT to improve our river. Their annual report - see link below - makes interesting reading. I draw your attention in particular to pages 6&7 which demonstrates the importance of our Access over Weir Project. The schematic representation on page 7 neatly summarises the other threats facing the Taw system which we are addressing - netting in the estuary, predation, poor water quality, over-shading and poor spawning habitat. As many of you will already know Orri Vigfússon, who has done so much to protect the Atlantic salmon, died recently. The link that follows accesses an article which honours his legacy. Honoring the legacy of Orri Vigfússon. Number of salmon caught on the Taw so far this season - 24, including a 18 pounder earlier this week. This is encouraging though the river is now on the low side and as always we need rain. 15 salmon have been caught mostly in the 10 to 12lb range and 4 sea trout. Roger Furniss, Secretary, Southwest Rivers Association, presented the attached paper at the Council Meeting I attended last week. Click here to read. It is full of interesting information about smolt survival and should prove extremely useful for river management purposes. Warning - care when buying your fishing licence online. We have just received the attached notification from the Environment Agency. There are some unscrupulous websites offering a 'check and send' service for people purchasing the new rod fishing licence online. This is unnecessary and may lead to people paying more than is necessary. Please have a read of the attached by clicking here and circulate it as widely as possible. Please think once, twice or even three times before you knock a salmon or sea tout on the head this season. Consider "Do I really need to kill this fish?" Apart from the obvious conservation benefits, it also makes less likely the imposition of mandatory 100% catch and release which we, RTFA, oppose. All of us need to do everything we can to increase the release percentage for salmon and sea trout on our river. This presentation by Dr Ronald Campbell, the highly respected fisheries scientist on the River Tweed. Historic Changes in Tweed Salmon Runs. Excellent brown trout fishing available on the Upper Taw. The Taw Fishing Club is looking for new members. Click on link below for details. Wayne Thomas, the Fishing Correspondent of the North Devon Journal, attended our AGM on 17 March as a guest of the Association. He has written an excellent summary of the proceedings for his website. A Happy New Year to all members. Let's hope for an exceptional fishing season with a good flow of water from March to September. Only two months to go now. An important date for your diaries, AGM at HIGHBULLEN HOTEL on FRIDAY, 17 MARCH. Our speaker will be Simon Evans, Chief Executive, Wye & Usk Foundation. Full details to follow by mail in due course. Please note that rod licence returns for last season need to be submitted to the EA by 1st January. This is extremely important for river management purposes. Please use this number to report anything untoward seen on the river. This would include poaching or signs of poaching, dead or diseased fish and pollution. The finished TRIP project report has been completed and can be accessed by clicking this link here. River levels have been steadily dropping over the last three months although we did have a small freshet for 24 hours in May. A few fish have been landed in the 8 - 10lb bracket most having been caught during the last hour of day light on small flies. A lift in water would certainly get things going. Seatrout fishing has also been quiet, but fish have been reported in the lower river, typically seatrout will run in very low conditions, so worth putting some hours in, it is June after all, prime time for a big pug. Trout fishing in the evenings has produced some nice sport on some lower beats, one angler on a middle beat had some cracking sport landing and returning several trout, best of which was a plump 1.5lb and all taken on small olives. There have been very good numbers of smolt dropping back. Please be careful when handling these valuable fish. Always wet your hands if you have to handle any fish and if possible shake off the hook in the water. It is wise to fish barbless if large numbers of smolt are present. 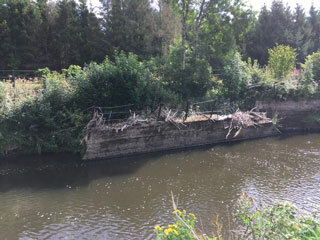 Members faced with the problem of a tree in the river should report the fact to the EA Hotline on 0800 80 70 60, giving as much detail as possible about the tree obstruction. The EA will then assess whether they will remove the tree or leave it as the responsibility of the riparian owner. The main consideration will be flood risk. It appears that at present the EA is taking a more flexible approach perhaps because more funds are available. River levels have dropped but fish are still entering the system. Big tides have pulled some nice fish into the river. A number of fish have landed with 2 fish of 18lb recently and another of 13lb the notable catches, all very fresh and in cracking condition. Not many fish have been showing due to the cold spring weather, hopefully this will change with a drop of rain and some warmer water temperatures. The large seatrout should start to appear now, it is worth an hour or two, there is every chance of a big pug. These fish are typically 6lb plus. Do remember the voluntary code regarding seatrout and to return fish over 4lb and under 1lb. Trout have been moving in the afternoons during the warmer moments and some good hatches of fly have been coming off. Salmon and seatrout smolts are now present so please handle with care if you catch any, always wet your hands before handling. April, May and June provide some of the best sport on the river so get out and have a go. Anyone who has lost the top section of a rod recently above Umberleigh Bridge should contact Julian Zealey at the Rising Sun on 01769 560 447. A very successful AGM was held at Highbullen Hotel. A number of new appointments were made to the Committee - see website menu for new composition of the Committee - most importantly Richard Nickell has taken over as Treasurer from Mac McCarthy The auction raised about £3,500 for the river. Over 40 people stayed for supper. The 2015 season had good water conditions generally. This resulted in a rod catch of 188 salmon (85% released) and 369 sea trout (75% released). Comparable figures for 2014 were 115 salmon (83% released) and 290 sea trout (75% released). The salmon numbers were disappointing inasmuch as we had expected a figure nearer 250. This will be looked into. Salmon netsmen on the Taw/Torridge estuary took 53 salmon while Taw/Torridge fishermen took only 37. We continue to support the banning of this kind of netting. Northam Burrows Landfill continues to be a threat to the ecology of the estuary. Together with the Torridge Association we have involved Angling Trust and the Maritime Conservation Authority in putting pressure on the appropriate authorities to resolve this sorry state of affairs. We are an active member of South West Rivers Authority, Exmoor Rivers & Streams Group and more recently Dartmoor Steering Group. We continue to work closely with Westcountry Rivers Trust and the EA in planning and carrying out river improvement work. 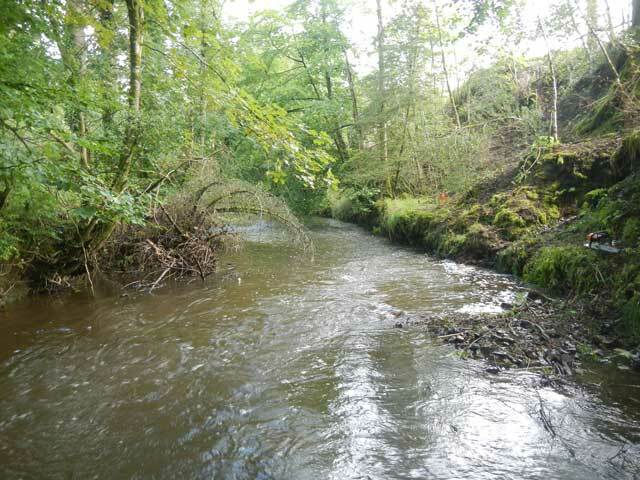 With the 12 weir project and the £1.8m TRIP behind us the focus will be on water quality and habitat improvement. There are a few minor weirs on tributaries which need attention and these should be sorted out this year. Attention will be given to the major tributaries which are in poor shape, particularly the Little Dart and the Lapford Yeo. We have made funds available to Westcountry Rivers Trust to finance a Himalayan Balsam survey - the first step to attacking this pernicious problem - and to finance 2 years of juvenile surveys. This latter is an attempt to pick up the slack from the EA's cut-backs in this area. We await the first results. There will be a new initiative to find a cadre of volunteers to support the Riverfly Partnership which is working well on the Torridge, but has not got off the ground on the Taw. 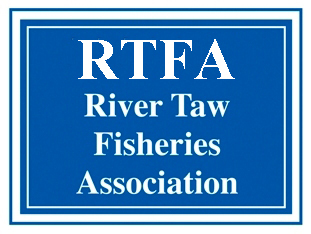 The Treasurer summarised a healthy position in RTFA itself (cash balance £1,850) and in the River Taw Trust (cash balance £8,763), this before banking the auction proceeds. Subscriptions will remain unchanged, Members (riparian owners) £35 and Associate Members £15. There is a major push to have all subscriptions on a standing order basis to save time and money. Membership has increased from 139 to 143, but there are still many non-members who fish the river. Members were encouraged to help with recruitment. The guest speaker, Roger Furniss, Secretary of the Westcountry Rivers Trust, gave a thorough exposition of the current situation regarding salmon netting, commercial sea fish netting in the estuary and in-shore (the by-catch problem) and the broader international threats to the Atlantic salmon. This included a summary of what the various initiatives and campaigns have achieved so far. Paul Carter, EA High Impact Fisheries Enforcement Co-ordinator, explained the effect of the most recent cuts and the retirement of Jerry Boyd. Paul Carter is now responsible on his own for enforcement on the Taw (including the Mole and Bray), the Torridge and the Lyn. He needs all of us more than ever to act as his eyes and ears. We should be vigilant. Presentations were made and thanks given to Mac McCarthy, the outgoing Treasurer, and to Jerry Boyd. Both have given many years of excellent service to our river. EA Enforcement on the River Taw. As a result of the recent retirement of EA Enforcement Officer, Jerry Boyd, and cut-backs within the EA, Paul Carter, High Impact Fisheries Enforcement Co-ordinator, now covers the Taw, including the Mole and Bray, the Torridge and the Lyn. More than ever he needs Taw fishermen to act as his eyes and ears on the river. This is a responsibility each of us should take seriously. Members should not take action themselves, but should bring incidents to the attention of Paul Carter on 07768 007 363 as quickly as possible.